Tony has joined the Advisory Board for ‘Commemoration, Conflict and Conscience’ a year-long project which culminates in a national festival in Bristol, 27th-28thApril 2019. The project looks at hidden or lesser known stories of the First World War, legacy, peace-building & alienation from commemoration. We are: uniting existing community groups and researchers, focusing on their work to date & generating new research; showcasing existing artistic work and performances and fostering new creative projects. The project is funded by the Arts & Humanities Research Council through the Everyday Lives in War Centre at the University of Hertfordshire. 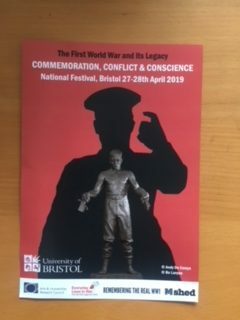 It is led by Lois Bibbings, Professor of Law, Gender and History (University of Bristol), working with Dr Corinne Painter (University of Leeds), the Remembering the Real World War 1 group in Bristol, and supported by an Advisory Board. The Festival will bring together community groups, local historians, academics, campaigners and activists, artists and performers in a free, open access weekend event timed to coincide with the centenary of the release of many absolutist conscientious objectors in April 1919. The MShed in Bristol (part of Bristol Museums) will be the festival hub, with talks, film showings, exhibitions and performances – but linked events will take place in other parts of the city over the course of the weekend and also leading up to and following it. Focusing on the First World War then and now, the project will look at, for example, conscientious objectors to military service, strikes, mutinies, desertion and absenteeism, the men executed by the British military and the Shot at Dawn campaign which fought for them to be pardoned, the global reach of the war, colonial and commonwealth experiences, women’s peace activism, along with legacy, peace-building & alienation from commemoration.